Fun baby development of play ideas together with a list of best baby toys have been published on Kids Activities Blog. 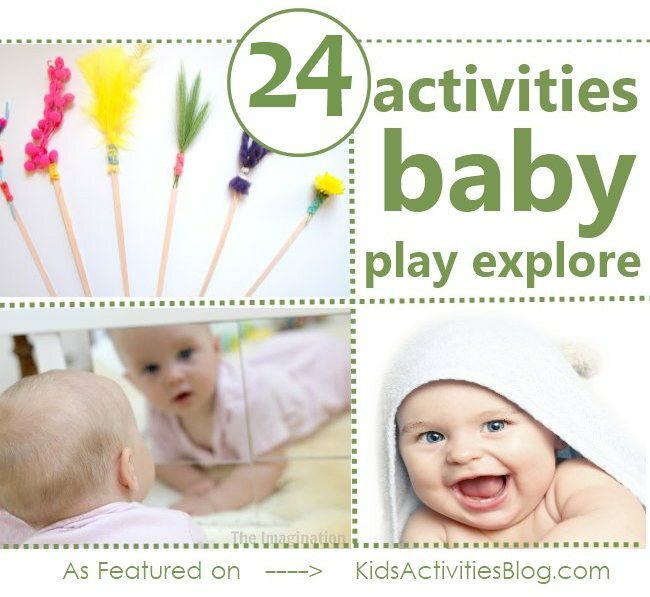 These activity ideas will help to connect, interact, and aid the babies development. Find great tips from seasoned Moms about what the baby really needs. Being a first time Mom can be overwhelming. Seasoned Moms have come up with a list of their favorite activities. To connect and interact with an infant is critical to stimulate the baby development of play. Specific ages require specific stimulants and the wide arrange of toys and games can be very overwhelming for any Mom. The list of best baby toys recommended by seasoned Moms includes the Sassy Ring O'Links Rattle Developmental Toy for infants. This cute toy attaches easily to the stroller or car seat to keep the little ones busy. The baby will be easily entertained by the bright colors and different textures as they interact with the toy. The activity gym is not just for babies, but a saving grace for Moms. Find one that has the ability to play music and the little one will play away just long enough for Mommy to take a shower or get dinner started. The Very Hungry Caterpillar Teether Rattle by Kids Preferred is perfect for a baby that is starting out trying to put everything in his or her mouth. The ends are made out of soft plastic that soothes babies gums and the textured fabrics and tags keep the baby interested for a long time. An Exersaucer or Jumparoo is perfect for babies ages 6 months and up that are gaining strengths in their legs and backs. They will love bouncing away and interact with the attached toys. At 6 months they are also getting to be very interactive which makes reading to them so much fun. Building blocks, sensory tubs, pretend play, and mirror play are also some of the fun recommended Mom activities for babies. For detailed instructions and to get additional baby toy and activity ideas, check out Kids Activities Blog this week. Come get inspired to let the babies have fun exploring the world around them. Kids Activities Blog is a website created by two moms (who collectively have 9 children), Rachel Miller and Holly Homer from June Cleaver Nirvana. It is their daily goal to inspire parents and teachers to play with kids. This interactive website publishes simple things to do with kids twice a day. Kids Activities Blog is a great tool for moms and teachers to find kid-friendly activities that create memories and sneak learning into the fun.